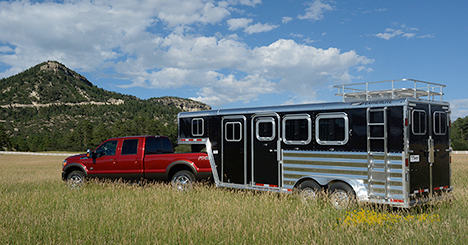 Featherlite horse trailers are fit for your life – and your horse. With safety features and unmatched durability, owning a Featherlite horse trailer gives you more value for the long haul. With a Featherlite horse trailer, you’ll find durable all-aluminum construction with superior resistance to rust & corrosion along with a lighter, smoother tow. Featherlite’s newly redesigned feed doors feature a heavy duty frame and bars for extra strength while still giving your horse maximum airflow & light. Its lowered handle is also easier to use! Other great features include deep cushion rubber floor mats that safeguard your horses during travel and spring-loaded slam latch dividers that feature a quick lock. Receive peace of mind with Featherlite’s 10-year limited structural warranty with 3-year bumper-to-bumper warranty on most models. Featherlite’s newest models are its Legend Edition Models 8542 and 8582. These trailers feature a new design with heavy duty square cornered streetside drop down feed doors. Unload doors and camper doors are also square cornered. One exterior tie ring per horse per side is standard. Standard upgrades include aluminum brush tray, aluminum halter bars, swinging blanket bar and additional LED clearance lights. Check out the full line up of Featherlite horse trailers today. Options include gooseneck, bumper pull, living quarters and stock/combo trailers. Then find a nearby dealer using our dealer locator.